What are the chances a horse would be disqualified from a maiden win – not once, but twice – as a result of post-race drug tests? That's what happened to J. J. 's Candy, a 3-year-old Sidney's Candy colt owned by Big Monk Stable and Liorah Stables and trained by Juan Vazquez. J.J.'s Candy's first disqualification came at Parx Racing on Jan. 31, 2017, when a post-race test showed the presence of glycopyrrolate, according to a March 20 ruling from the Pennsylvania Horse Racing Commission board of stewards. On May 8, stewards fined Vazquez $1,500 and suspended him for 15 days, from May 21 through June 4, for the medication violation. On May 12, stewards issued a ruling disqualifying J. J. 's Candy from an April 4 maiden win at Parx. Once again, the horse tested positive for glycopyrrolate, the generic form of Robinul, which reduces secretions in the mouth, throat, airways and stomach. It is a Class IV medication under the guidelines of the Association of Racing Commissioners International. A hearing will be conducted to determine any sanctions against Vazquez on the latest J. J. 's Candy disqualification. J.J.'s Candy, meanwhile, ran fourth in the $100,500 Parx Derby on May 6. The colt was saddled that day by trainer Carlos Soto while Vazquez was serving a suspension for an unrelated medication violation. That suspension, to run from April 30-May 20, resulted from a positive test in the horse Red Doctober for the bronchodilator clenbuterol on May 8, 2016. Vazquez appealed the suspension and $2,500 fine but in February 2017 dropped his appeal. Vazquez also faces a possible suspension for another 2017 medication violation after McKenzies Way was disqualified from a Feb. 14 win at Parx as a result of a post-race test showing the presence of the corticosteroid betamethasone. 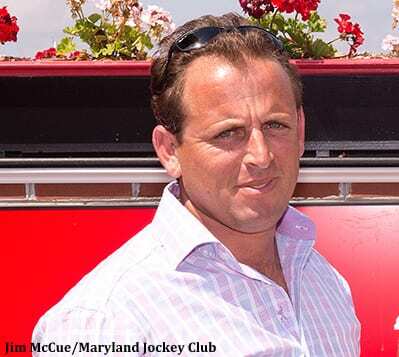 Vazquez was recently notified by The Jockey Club that he is being denied all privileges of the American Stud Book for one year as a result of multiple medication violations in 2014-15. This entry was posted in NL Article, The Biz and tagged betamethasone, clenbuterol, drugs in racing, glycopyrrolate, J.J.'s Candy, juan vazquez, Parx Racing, pennsylvania horse racing commission, Robinul, The Jockey Club by Paulick Report Staff. Bookmark the permalink.